Hurray! 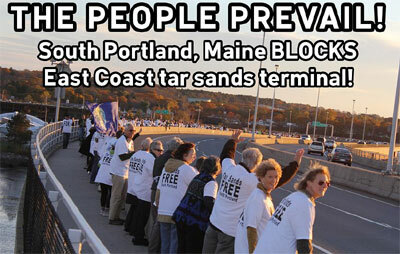 No Tar Sands Will Pass Through Maine!! With great joy and appreciation, I am thrilled to announce that South Portland, Maine voted to keep tar sands oil out of Maine!!!! Last night, South Portland's City Council voted 6-1 to pass the Clear Skies Ordinance - which amends the code so that a terminal to store, process and export tar sands oil can't be built. community (which is already high from existing oil infrastructure). It also protects the scenic coast from being marred by two towering, 70-foot smokestacks. Supporters packed the meeting room in anticipation of the vote, erupting with cheers and applause. This is a big win for all of New England, the US and the world. Hopefully, this will be the end to one of the key routes Canada's oil companies want to use to export tar sands oil from the US. A pipeline from Alberta to Montreal is approved that would then travel through Vermont, New Hampshire and across Maine's cherished lakes region (where I live during the summer), threatening the entire region with tar sands spills. In Maine, an old 62-year-old crude oil pipeline would be reversed to carry the much more corrosive oil to the coast. It's Canada's "Plan C" option for exporting tar sands oil, in case Keystone is rejected and they can't ram it through First Nation's land to the west coast of Canada. 33 towns in Maine and Vermont and 49 in Québec passed resolutions opposing the movement oftar sands oil through their state/province. Vermont's resolutions also call for banning the use of tar sands oil in New England. Outreach Manager for Natural Resources Council of Maine. Oil interests spent $750,000 to defeat a referendum in last year's elections - it would have approved a land use ordinance that stopped the reversal of the Portland - Montreal Pipeline. When it lost by just 192 votes, South Portland's council took up the charge by writing it into a zoning change. "We are absolutely thrilled, relieved, and exhausted. Of course, we know it may not be over yet, and we're committed to defend this victory from oil industry attacks," says Mary-Jane Ferrier for Protect South Portland, which has been behind the grassroots effort. "This is a true David versus Goliath victory," says Emily Figdor, Executive Director of Environment Maine. "The oil industry is not invincible, and the exploitation of tar sands is not inevitable. From Nebraska to Maine, citizens are standing up to protect their communities - and we are winning. We're hopeful that South Portland's action will empower other communities threatened by new tar sands infrastructure to protect themselves." You can be sure the fight isn't over. Oil interests threaten court action and/or another referendum in the 2014 election. The city is creating a separate legal fund for the likely court battle it faces.